Another magnet from @KristinaMyers' Etsy store. 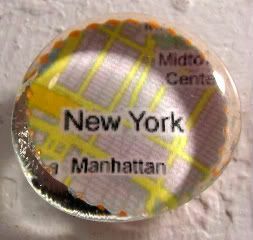 I ended up buying a whole set of these map location magnets. I could get in trouble figuring out more and more places to request, but I do love them so. DCsis and STWsis and STWfiance are in town this weekend, so that STWfiance can finally play tourist. This is opposed to the usual running around town, but never really getting to see anything. Now, we're gonna try and jam pack the weekend, end to end with everything like Governors and Roosevelt Island, the Intrepid, Central Park Zoo, the Met, and who knows what else I'm forgetting. Yep. It's gonna be a challenge, I think, with 18 of 27 subways undergoing major repairs this weekend, plus the Avon walkers. But hey, ya'll know I love playing tourist! Yay for the best city in the world! this is a very good idea. lets have fun! I am sooo envious. Have a great time! There's no better city to play tourist, even with the crazy subways. Plus, there's always buses.